The butterfly alights for a moment, then flies on, leaving a flutter of delight. 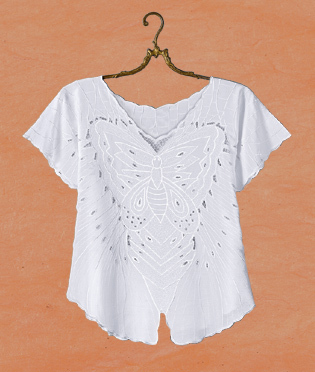 Let your spirit fly with the butterfly in this top - eyelet lace and extensive embroidery trace a butterfly front and back, with scalloped, shaped hem describing the wings. Silky rayon with satin embroidery skims you lightly. Approx. 24" at longest. Imported. Rayon; hand wash. Sizes M, L, XL, XXL, 3XL.